"A photograph is an interpretation of the world. 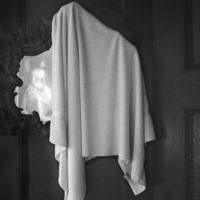 Regina DeLuise could rightly describe what is seen in her pictures as her world because, through the very act of selecting from the world, she’s added something, expanding our understanding of what might be the case — given something that was not there before, something that was not yet the case until the making of the photograph. First of all, she selects tone as a language for rendering light; in agreement with a longstanding photographic tradition but in contradiction to most current practice in the field, she understands that something of the mute and irreducible existence of things can be expressed more forcefully in shades of gray than through prismatic color. Strange: the color of things is not recorded in these photographs, but it is not missing from them." ON VIEW: Thursday, January 31 - Sunday, March 17, 2019.